Link-a-Pix puzzles can be played interactively on the computer, offering many features and advantages compared to pencil and paper. This section explains everything about how to play Link-a-Pix Interactive. If you are not yet familiar with the puzzle rules, please go to Link-a-Pix rules. 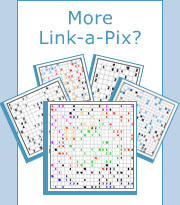 Link-a-Pix Interactive is played by creating links in a grid according to the rules. To create a link, click mouse on a clue and drag to a square with the same clue so that the length of the path equals the value of the clues. Links with length 1 are created with a single click. To edit, click one of the link’s ends and drag mouse to redraw the path. To delete, double click mouse anywhere on the partial link’s path. Partial links are helpful when only part of the path can be solved. To create a partial link, click mouse on a clue, drag, and release on an empty square. To edit, click one of the partial link’s ends and drag mouse to redraw the path. To delete, double click mouse anywhere on the partial link’s path. To merge, drag free end of the partial link to the free end of another partial link. Temporary links are helpful to draw provisional paths which are not connected to any clue. To create a temporary link, click mouse on an empty square, drag, and release on another empty square. To edit, click one of the temporary link’s ends and drag mouse to redraw the path. To delete, double click mouse anywhere on the temporary link’s path. To merge with a clue, a partial link or another temporary link, drag end of the temporary link to the desired location. All game functions are accessed through the toolbar. For some toolbar buttons, keyboard shortcut keys are also available as listed below. Toolbar may be positioned horizontally or vertically using the rotate button on the left edge, and relocated anywhere in the game by dragging its frame. Enlarge small puzzles for best viewing on your screen. Reduce large puzzles for best fit on your screen. Go back as many steps in the game as you want. Go forward after using Undo as many steps as you want. Restart puzzle to solve from the beginning. Check all filled and blanked squares for errors. Show preview and elapsed solving time. Show solution of the puzzle. Using this button will also end the game. Open Preferences dialog box. New preferences will be automatically saved on the computer. Auto fill starting clues: Check this box to automatically fill all links of length 1. Show errors: Check this box to show errors while the puzzle is solved. Show link length counters: Check or uncheck this box to show or hide link length counters. Sound on: Check this box to turn sound on. Open About dialog box to see puzzle size, difficulty, ID, title and other information. Open Link-a-Pix Interactive page you are reading now. Open Print dialog box. New print options will be automatically saved on the computer. Puzzle: Select to print puzzle. Solution: Select to print solution. Current state: Select to print current solution state. Preferred image scale: Reduce or enlarge printout. Attempt to reduce to page: Check this box to automatically fit large puzzles on a single page. When this box is unchecked, large puzzles will print in multiple pages according to selected scaling. Attempt to enlarge to page: Check this box to automatically enlarge small puzzles to fit on a whole page. When this box is unchecked, small puzzles will print according to selected scaling. Select optimal orientation: Check this box to automatically select puzzle orientation. Save current state of the puzzle.